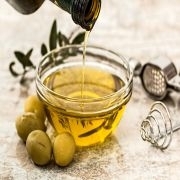 Herbs De Provence Olive Oil. With top notes of savory, thyme and bay leaf, our all-natural Herbs de Provence olive oil is a show stopper when drizzled over grilled chicken, rubbed on roasted turkey, for bread dipping, or try in aioli. Suggested Olive Oil and Balsamic Combinations 18-year-old traditional balsamic, 12-year-old aged balsamic, Black Cherry balsamic, Fig balsamic, Red Apple balsamic, Strawberry balsamic, Raspberry balsamic, Blackberry Ginger balsamic, Honey Ginger balsamic, Sicilian Lemon balsamic, Peach balsamic, Serrano Honey balsamic.